This park is far from the stereotypical park full of lush forests and dirt trails. In fact, only five percent of Biscayne is land. This small percentage includes around 40 small barrier coral reef islands and a mangrove shoreline. And it is the coral reef that houses the most extensive life-forms you may ever get a chance to see. Biscayne offers a complex ecosystem full of brightly colored fish, uniquely-shaped coral, and miles of wavy seagrass. It is the perfect destination for outdoor enthusiasts who seek aquatic adventures or those tourists looking to simply relax and look out over the bay. It is hard to imagine that this natural wonder was once almost destroyed. Before preservation, the area was threatened in the 1960’s when developers were looking to build resorts and subdivisions on Florida’s northern keys. Construction was targeted from Key Biscayne to Key Largo. But conservationists fought to preserve Biscayne Bay. In 1968, Biscayne Bay became a national monument and in 1974 the area finally became a national park. 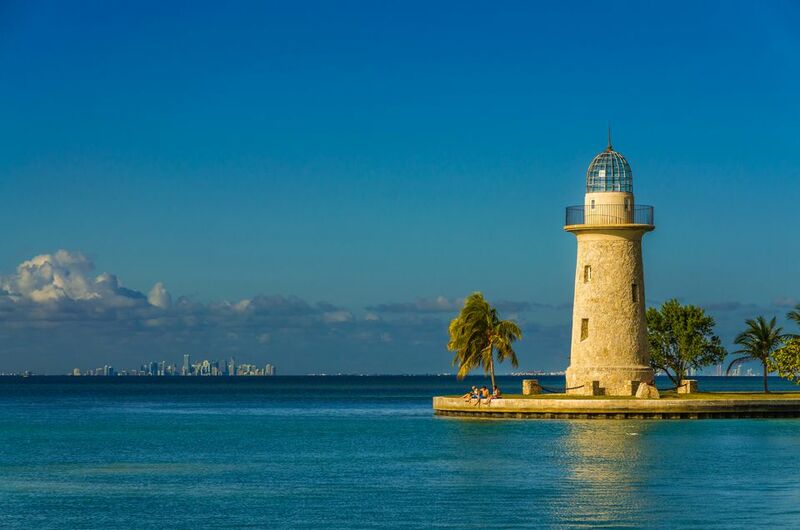 The park is open year-round and the water portion of Biscayne National Park is open 24 hours a day. The best time to visit the park’s islands is from mid-December to mid-April during Florida’s dry season. Summer is typically warmer and provides calm seas ideal for snorkeling and diving but visitors should be prepared to battle mosquitoes and thunderstorms. Head to Miami and take the Florida Turnpike (Fla. 821) south to Speedway Blvd. Head south on Speedway for about four miles and turn left (east) onto North Canal Drive. Follow that for another four miles until you reach the park’s entrance. There is no entrance fee for the park. There is a $20 overnight fee for those campers who have boats that need docking. Tent campers will be charged $15 a night for a tent on Elliott Key and Boca Chita Key. Group camping is also offered for $30 per night. A reef cruise is one of the best ways to visit Biscayne. Tourists will come in contact with more than 325 types of fish, shrimp, crabs, spiny lobsters, and even birds such as herons and cormorants. Boats leave from Convoy Point and visitors will enjoy an orientation to the bay’s unique flora and fauna before departure. A glass-bottom boat allows tourists a peek into the world below without having to dip into the sometimes chilly sea. Those feeling more adventurous can enjoy specific tours for snorkeling and scuba diving giving an up-close and personal experience. Tours for boaters and snorkelers take around three hours, while scuba tours take much longer. Your reward will be in all you see, including mountainous star coral, yellow snapper fish, manatees, angelfish, and more. Cruises also pass through Caesar Creek which was named for a legendary pirate, Black Caesar. More than 50 shipwrecks have been recorded within the park boundaries and many can be viewed as federal law protects them from souvenir collectors. Mangrove Shore is an option for those with little time or who have no access to a boat. Take a stroll around Convoy Point and perhaps take in a picnic. The surrounding trees attract many birds, including the rare peregrine falcon and bald eagle. Barnacles, fish, and other sea creatures also bunch around the trees’ half-submerged roots. Biscyane offers two boat-in campgrounds, both of which have a 14-day limit. Boca Chita Key and Elliot Key are open year-round, first come, first-served. Keep in mind that reservations are not accepted for individual tent sites. Within the area, visitors will find numerous hotels, motels, and inns. Florida City offers plenty of accommodations as well. With so much to see underwater, some visitors may seek excursions outside the park’s watery walls. Try the Great White Heron National Wildlife Refuge for a unique afternoon outing. Located in Big Pine Key, this refuge is dedicated to the protection of the great white heron. Its mangrove islands also protect roseate spoonbills, white-crowned pigeons, and shelter ibis. The area is open year-round and accessible by boat only. If one park isn’t enough, visit John Pennekamp Coral Reef State Park located 40 miles from Biscayne in Key Largo. This undersea park is also accessible by a glass-floor boat or by scuba-diving. The state park is open year-round and offers campsites, hiking trails, picnic areas, and boating.